In today’s global economy, workers live across pre-industrial, complex and post-industrial societies, and countries vary by the level of technological availability and by the level of complexity in the economy. Low-, medium- and high-skilled work is thus distributed unevenly across labour markets. An economy’s broadening know-how—resulting, for example, from sectoral development or the introduction of foreign direct investment—brings with it the opportunity to form new practices and expand the capabilities of the local workforce.18 The conceptual framework of the Human Capital Index recognizes that, once workers are deployed across the labour market, they can develop and deepen their skills through their day-to-day labour—they gain ‘know-how’. The Know-how subindex benchmarks the potential for enacting a virtuous cycle of opportunities for gaining new skills in the workplace and motivating investment in the development of higher skilled talent among private and public actors, as well as among individuals themselves. 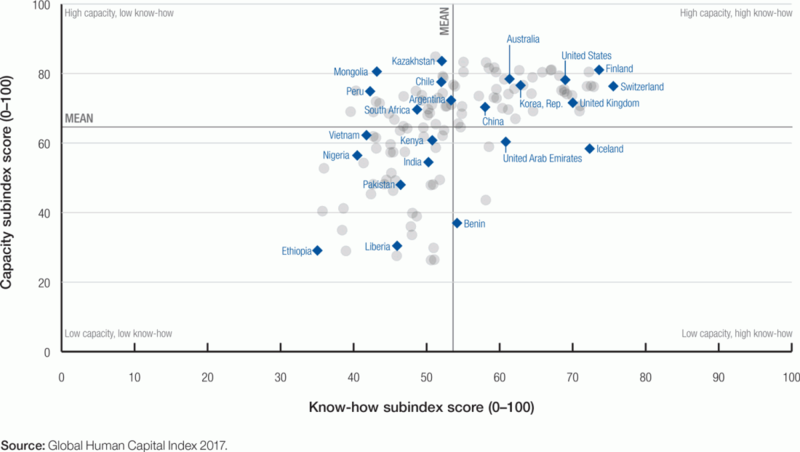 As reflected in Figure 15, economies with high human capital across the Know-how subindex generally also exhibit strong outcomes on the Capacity subindex. Countries with especially high Know-how scores have on average leveraged at least 70% of their human capital potential on the Capacity subindex across their younger and older generations. A very narrow set of economies have high know-how and low capacity, reflecting economies in which a large proportion of national economic value creation is delivered by a comparatively small group of specialist professionals. 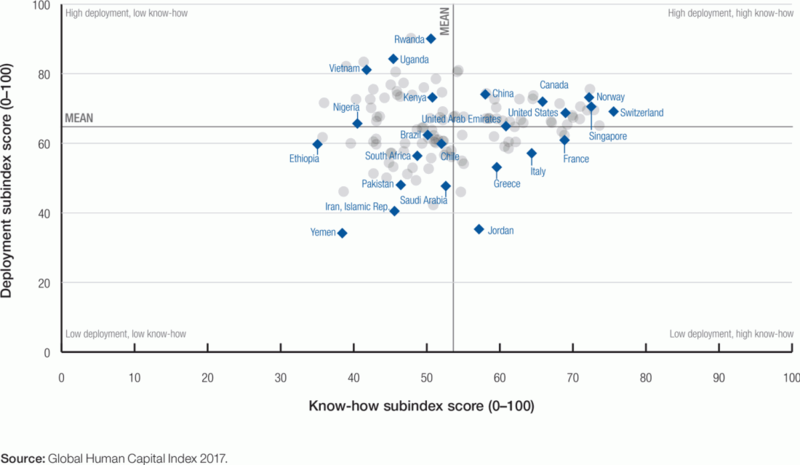 Among countries that have high capacity and lower know-how, the Index suggests ample opportunities to focus on expanding know-how through different mechanisms such as deepening participation in global value chains. Similarly, when plotting know-how against deployment, a number of countries find themselves in a situation of high know-how but low overall deployment (Figure 16). Economies such as France, Greece, Italy and the United Arab Emirates, in particular, have the potential to boost their human capital performance by increasing the exposure of their workforces to complex know-how and putting to work a larger share of their talent pool across their skill-intensive economies. 18 Baldwin, R., “Global supply chains: Why they emerged, why they matter, and where they are going,” CEPR Discussion Paper 9103, Centre for Economic Policy Research, 2012.